Gator-Face is the result of early experimentation on animal gene structure. Once an American Black Alligator basking in the sun of the swamp where he was born, he now serves the most rudimentary of his creator's whims-- destruction! Gator-Face retains the animal instincts honed before his transformation: a nose for blood, superb agility in water, patience to hold still for hours to surprise prey, and the savageness of the wild when in danger. 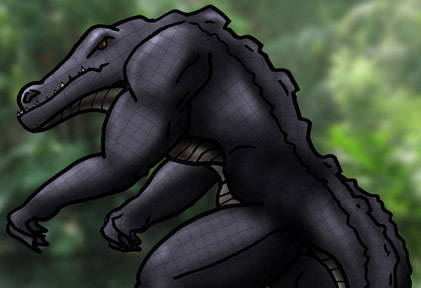 From his genetic transformation, Gator-Face has gained the ability to stand somewhat upright using his massive tail to balance his hunched over posture. Also, the gene therapy has given this monster a body thicker and more powerful than the best professional body builders-- though his not-quite human thoughts don't allow for expert control of his lumbering physique. Although his body resembles that of a human, he lacks the proper vocal chords for human speech-- leaving him only with the guttural rumbling of a wild 'gator. Gator-Face is not the latest or most intelligent of his creator's genetic experiments, but he is among the most brutal. He lives only to serve his creator-- the enigmatic scientist whose fascination with cross-breeding gene types remains unexplained.